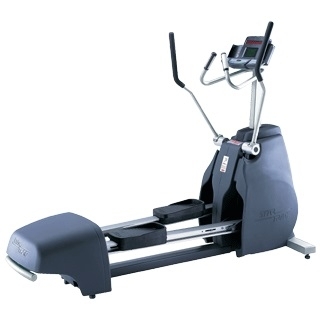 Star Trac’s 5200 Natural Runner Elliptical features an upper body component. Patterned after Star Trac’s revolutionary 4600 Natural Runner Elliptical, the 5200 Natural Runner Elliptical offers the same advanced design elements that make the 4600 Natural Runner such a great training partner: a longer horizontal stride, ergonomically correct body positioning and a host of user-friendly pre-programmed workout options. With 15 levels of intensity, the 5200 Natural Runner Elliptical offers a challenging total-body cardio workout to everyone from newer members to serious athletes. All the benefits of non-impact elliptical training, with an upper body component. Total body workout for more efficient calorie burn at lower resistance levels. 15 levels of intensity allow for an enjoyable workout for those of all fitness levels. Dimensions: 86" x 33" x 67"